Hey There! 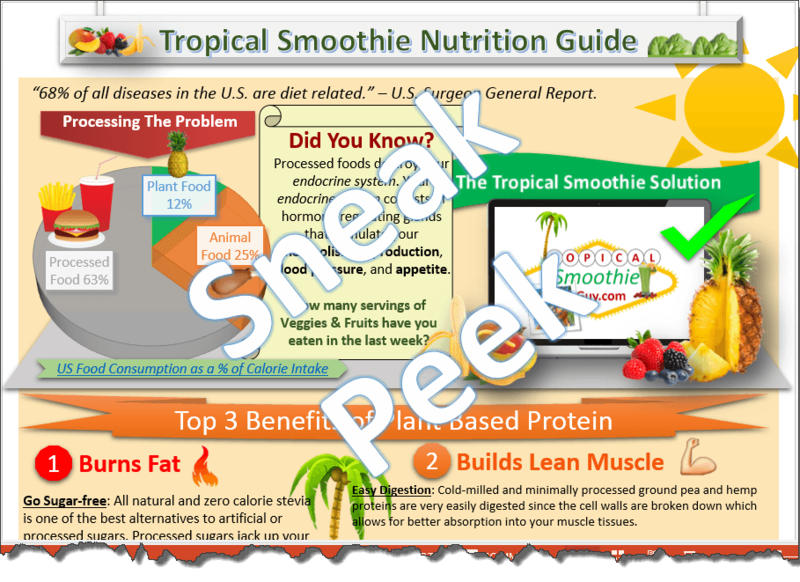 Welcome to my Tropical Smoothie Nutrition Guides! 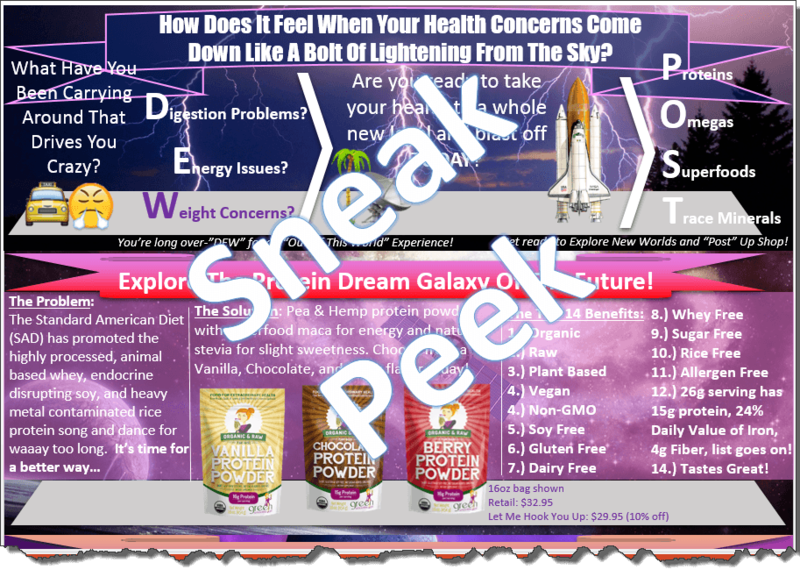 I offer free training so you can learn about protein, omegas, superfoods, and trace minerals in a fun and encouraging way. Sign up on the top right corner of this page to start harvesting the benefits today! Okay, well maybe not the mean part! Quick question: have you heard of PDD…Protein-Deficit-Disorder? Neither have I! We actually get a lot of protein in our diet, but where you get it from and the quality of it is very important. I’ll show you how plant based protein can help you burn fat, build lean muscle, and have more energy. Am I saying people should give up meat? By no means! What I am I offering is a way to look at whole foods as a more primary source of protein and ultimately way of life. It’s helped me realize that chicken, steak, pork, eggs, soy, and dairy aren’t the only “wheys” people can get high quality protein. Would you like to relieve pain, have better digestion, AND feel better? That makes two of us! Learn how plant based omegas are awesome for giving your body more omega 3’s (anti-inflammatory) and balancing out the omega-6’s (inflammatory causing) that’s typically gotten from processed foods. Clickity click the image to the left for more info. What makes superfoods so…well…super? I’ll break down the “whole” story on how whole foods like fruits, veggies, and greens are your best weapon against the terrible monsters of Unhealthy, Nasty, Inconvenient food options. What’s even more cool is that with each guide, I provide a lil somethin somethin at the bottom. It’s called, “The Wellness Philosophy” in this case , but other guides have inspirational philosophies that have really helped me develop more of a positive mindset around health. I was always told to color within the lines as a kid…and for a long time I did. But it’s time to break all the rules! Well…when it comes to tracing anyway. That’s because Trace Minerals don’t follow within the official guidelines of what you need exactly everyday, but your body needs them everyday. Make sense? Trace minerals give your cells what they need everyday to give your body the ability to wake up, stay awake, and fall asleep at night as examples. Without trace minerals, you could be short changing your body and health (which varies on what each person needs everyday). 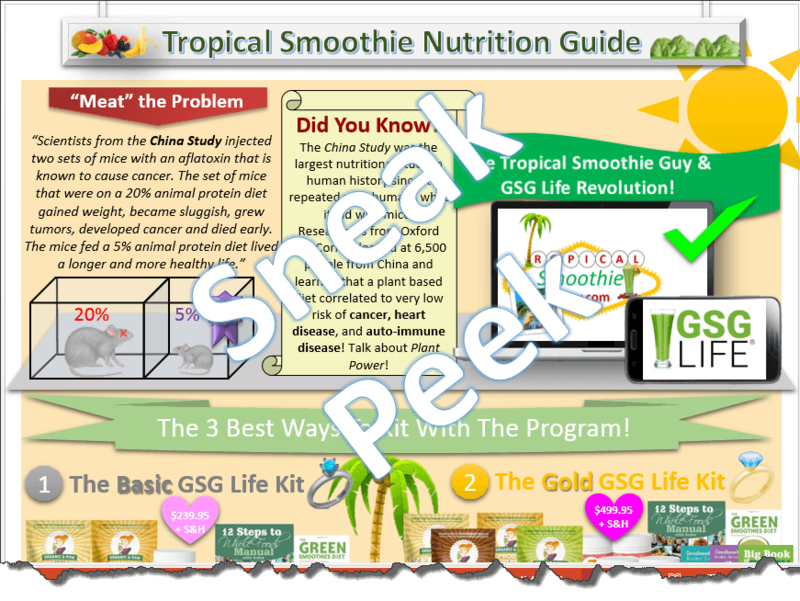 The Tropical Smoothie Guy and Green Smoothie Girl (GSG) Life collaboration of a lifetime! Well, it sounded good in theory anyway. Oh well…back to the drawing boards. Just kidding! I’ve partnered with GSG Life to offer you awesome protein powders, omega supplements, superfood powders, and trace minerals*. I put it all in a nice “space-age” theme to help with maximum absorption (we’re still talking about guides right?). There’s also a 10% discount on all the products when you’re interested. *Note: This is an affiliate program and I earn a commission based on anything you buy through me. It’s the same type of thang with any retailer like Costco or Sams Club. 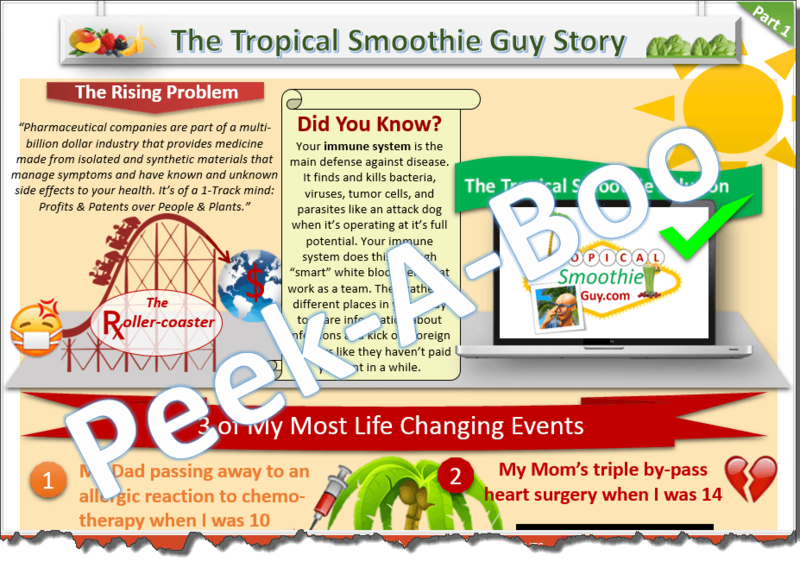 The Tropical Smoothie Guy and GSG Life team up again! This time it’s to offer you the opportunity to do what I do which is teach people about how to live a more fully charged and vibrant life! Whoa…whoa…whoa! Hold up just one green smoothie minute Lance! What if I’m not ready for all of that? No problem. Just check out what I have to offer and let me know what you think. I walk through the 3 kit options that GSG Life has* and show how it’s truly an amazing offer when you look at the supplements, learning, and growth opportunities that are in front of you. Have you ever played “Peek-a-boo” with one of your children or someone else’s kids? Well, I must have done it waaay too much with all my nieces and nephews because it somehow “mysteriously” made it’s way into the sneak peak into the first part of my crazy life story! No but foreal, my dad and mom have been really strong influences in my life. I wanted to share two events that happened with my parents and how they changed my life forever when it came to thinking about my own health. You know I couldn’t just couldn’t leave you hanging! It’s more like I had more to say and that last page just couldn’t fit it all! Well I included two specific events that also shaped my life and how I view my health and wanted to share that with you in hopes that you could relate in some way (whether it be through your own life or someone else’s that you know). P.S. Do you have a topic above that you’d like to learn more about or a different topic that you’d like for me to include in the future? Well, let me know! I’d love to hear how I can serve you in that way. P.S. Part 2: Learn about My Mission, Vision, & Passion and how it has “blended” right in to why I do what I do when it comes to helping your improve your health and accomplish your goals. 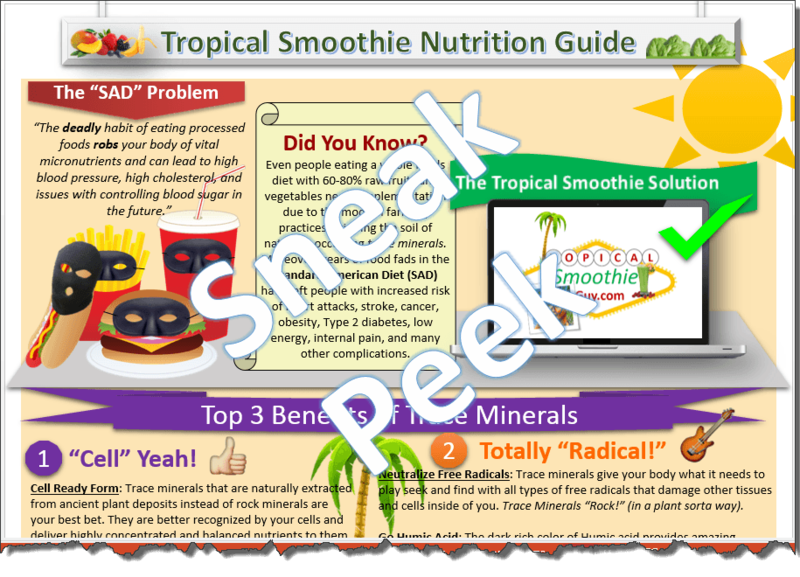 Additional Tropical “Secrets” available wheneva’ you want.